The miners were not kind to the caverns of the Sierra Nevada. The search for gold in the foothills led fortune-seekers all over the hills and valleys of the Mother Lode in the Sierra Nevada, and practically every slope and hollow was prospected for the elusive metal. They usually came up empty of the riches they sought so eagerly, but many times the miners would encounter an unexpected opening in the outcrops of marble that occurred here and there in the Calaveras Complex. They discovered dozens of caverns. For light they used torches and candles, and they didn't hesitate to break off cave decorations (speleothems) as souvenirs. A few enterprising miners realized they wouldn't get rich with gold so they charged admission to their caverns and made money from tourism instead. But they didn't control the behavior of their guests, and more speleothems disappeared. 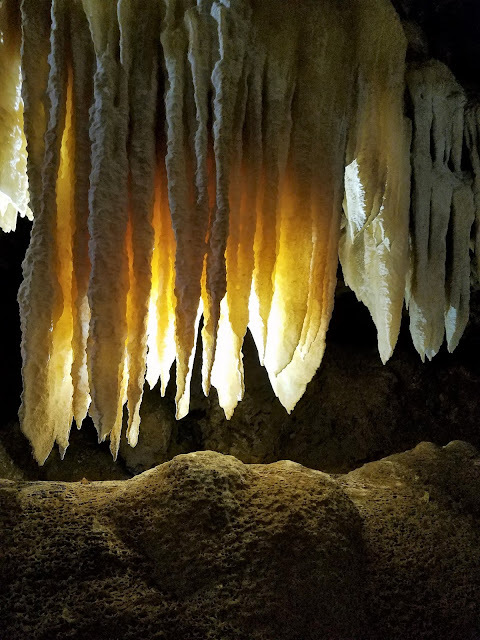 The once beautiful and intricate caverns were reduced to mere holes in the ground, and what decorations remained were grimy with soot and muddy fingerprints from visitors using them as handholds. Folks are sometimes surprised to find out the true color of stalactites and other speleothems; they're pure white. And they are so incredibly delicate. So-called soda straws and helictites are so fragile that a single touch will break them off, destroying thousands of years of exceedingly slow growth. The helictites of Black Chasm are particularly memorable. There are thousands and thousands of them, possibly the greatest accumulation of any cave in the country. The room where the visitors can view them is just one of several. The others are off-limits, and appropriately so. The origin of the helictites is obscure and is debated by cave researchers (speleologists). They obviously ignore gravity. Black Chasm cave is privately owned and offers tours (for a fee of course) all year long. They are located adjacent to the village of Volcano a few miles up the hill from Jackson on Highway 88. There are other "attractions" for kids at the site (panning for gems, breaking open geodes and that kind of thing), but they also offer some surprising sophisticated cave research publications for sale. They have always been very cooperative about arranging tours for our college groups. If you are ever in the Mother Lode, don't pass up this opportunity to see some truly pristine caverns.